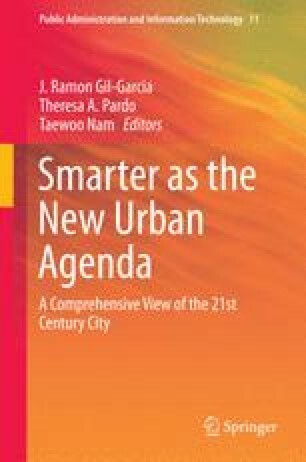 In sharp contrast to perspectives which overestimate the role played by technology in promoting smart cities initiatives, this chapter explores an important dimension for a full development of smart cities, the integration of human dimensions. Based on the theoretical model of Habermasian deliberative democracy, the chapter proposes a revision of the Chourabi et al. (2012) analytical framework for smart cities initiatives, in which people are as important as technology. In particular, we state that success of smart city initiatives depends upon the capability of integrating people and communities engagement with the advantages of information and communication technologies (ICTs), within a comprehensive smart city governance framework. Al-Dalou, R., & Abu-Shanab, E. (2013). E-participation levels and technologies. The 6th International Conference on Information Technology (ICIT 2013), Amman, Jordan, 8–10 May (pp. 1–8). http://sce.zuj.edu.jo/icit13/images/Camera%20Ready/E-Technology/656.pdf. Accessed 29 July 2014. Carter, L., & Belanger, F. (2004). Citizen adoption of electronic government initiatives. System Sciences. Proceedings of the 37th Annual Hawaii International Conference on IEEE (p. 10). http://www.computer.org/csdl/proceedings/hicss/2004/2056/05/205650119c.pdf. Accessed 29 July 2014. Chourabi, H., Nam, T., Walker, S., Gil-Garcia, J. R., Mellouli, S., Nahon, K., & Scholl, H. J. (2012). Understanding smart cities: An integrative framework. System Science (HICSS). 45th Hawaii International Conference on IEEE (pp. 2289–2297). http://www.computer.org/csdl/proceedings/hicss/2012/4525/00/4525c289.pdf. Accessed 29 July 2014. Clarke, M., & Stewart, J. (1998). Community governance, community leadership and the new local government. YPS for the Joseph Rowntree foundation. http://www.jrf.org.uk/system/files/lgr119.pdf. Accessed 29 July 2014. Department of Innovation, Industry and Regional Development, State Government of Victoria, Australia. (2009). Web 2.0: The new tools for democratic conversations—A snapshot of initiatives in government. http://www.egov.vic.gov.au/. Accessed 29 July 2014. European Commission. (2009). Public services 2.0: The impact of social computing on public services. Luxembourg: Office for Official Publications of the European Communities. http://ftp.jrc.es/EURdoc/JRC54203.pdf. Accessed 29 July 2014. Giffinger, R., Kramar, H., & Haindl, G. (2007). The role of rankings in growing city competition. Proceedings of the 11th European Urban Research Association (EURA) Conference, Milan, Italy, October 9–11. http://publik.tuwien.ac.at/files/PubDat_167218.pdf. Accessed 29 July 2014. Hall, R. E. (2000). The vision of a smart city. Proceedings of the 2nd International Life Extension Technology Workshop, Paris, France, September 28. http://www.osti.gov/bridge/servlets/purl/773961oyxp82/webviewable/773961.pdf. Accessed 29 July 2014. Holzer, M., Melitski, J., Rho, S., & Schwester, R. (2004). Restoring trust in government: The potential of digital citizen participation. E-Government Series, IBM Center for The Business of Government. http://www.businessofgovernment.org/sites/default/files/HolzerReport.pdf. Accessed 29 July 2014. Internet Content Syndication Council. (2008). Content creation and distribution in an expanding Internet universe: A white paper. http://internetsyndication.org. Accessed 29 July 2014. Komninos, N., Pallot, M., & Schaffers, H. (2013). Special issue on smart cities and the future internet in europe. Journal of the Knowledge Economy, 4(2), 119–134. doi:http://dx.doi.org/10.1007/s13132-012-0083-x. Mooij, J. (2003). Smart governance? Politics in the policy process in Andhra Pradesh, India. (Working Paper 228). London: Overseas Development Institute. http://www.odi.org/sites/odi.org.uk/files/odi-assets/publications-opinion-files/2464.pdf. Mossberger, K., & Jimenez, B. (2009). Can e-government promote civic engagement? A study of local government websites in Illinois and the US. Institute for Policy and Civic Engagement Research Partnership. http://www.uic.edu/cuppa/ipce/interior/egovtfinalreport2009.pdf. Accessed 29 July 2014. OECD. (2001). Citizens as partners. Information, consultation, and public participation in policy making. Paris: OECD. http://www.oecd-ilibrary.org/docserver/download/4201131e.pdf?expires=1435076834&id=id&accname=id15861&checksum=2B2313630BEA54DF1FD511B4E55792A3. Stone, D. A. (1989). Causal stories and the formation of policy agendas. Political Science Quarterly, 104(2), 281. http://search.proquest.com/docview/208315275?accountid=1325. Toppeta, D. (2010). The smart city vision: How innovation and ICT can build smart, “Livable”, sustainable Cities. The Innovation Knowledge Foundation. http://www.thinkinnovation.org/file/research/23/en/Toppeta_Report_005_2010.pdf. Accessed 29 July 2014.